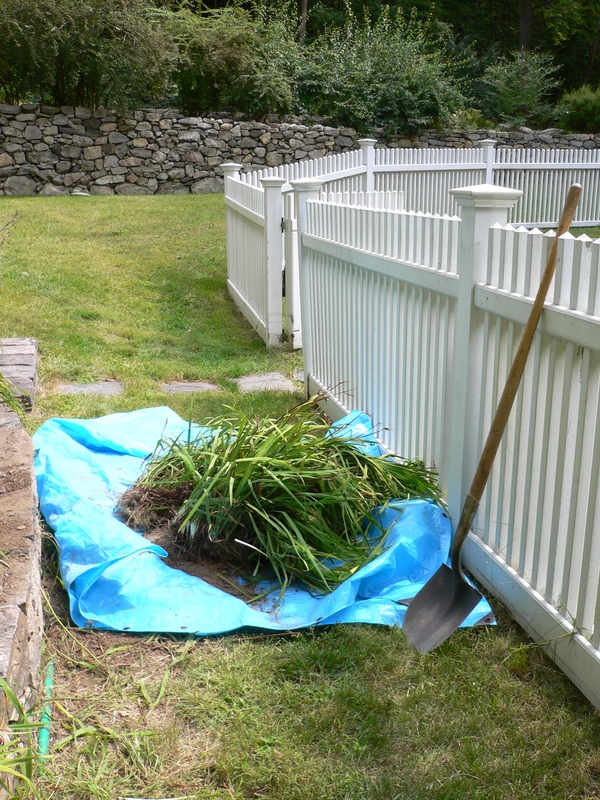 Believe it or not (I’m not sure I did), we still had not replanted all of the Siberian irises after our last root-dividing session (see September 15, 2012). 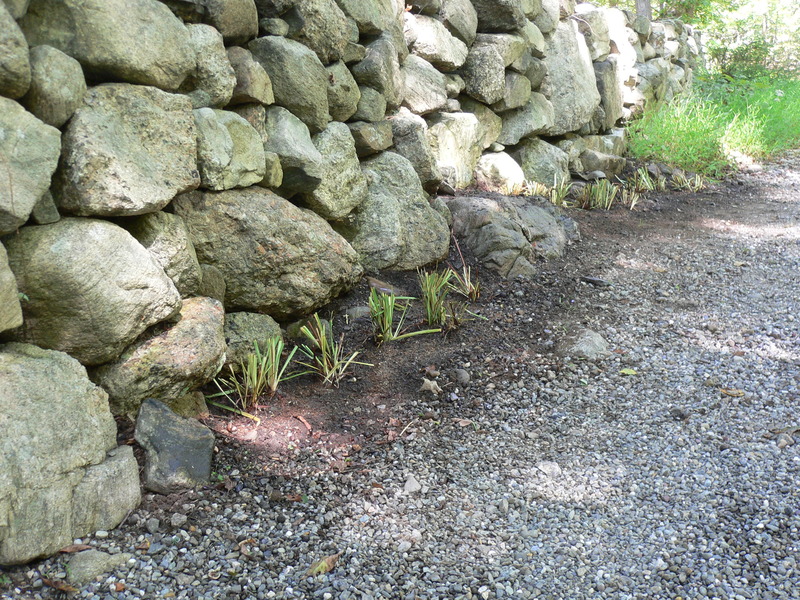 There is no more room in the ornamental garden and after scouting around (again) for suitable new locations, I ended up back at the strip of weeds next to the stone wall where we replanted some irises two weeks ago. Clearly, this was the place for them. After two hours of labor that can be summed up by a single punctuated word—rocks!—we are finally finished with the Siberian irises. When combined with the bearded irises, which we received from friends in exchange for a share of our Siberian ones and which we planted near the patio two weeks ago, we have done everything we need to do with irises for the next few years. 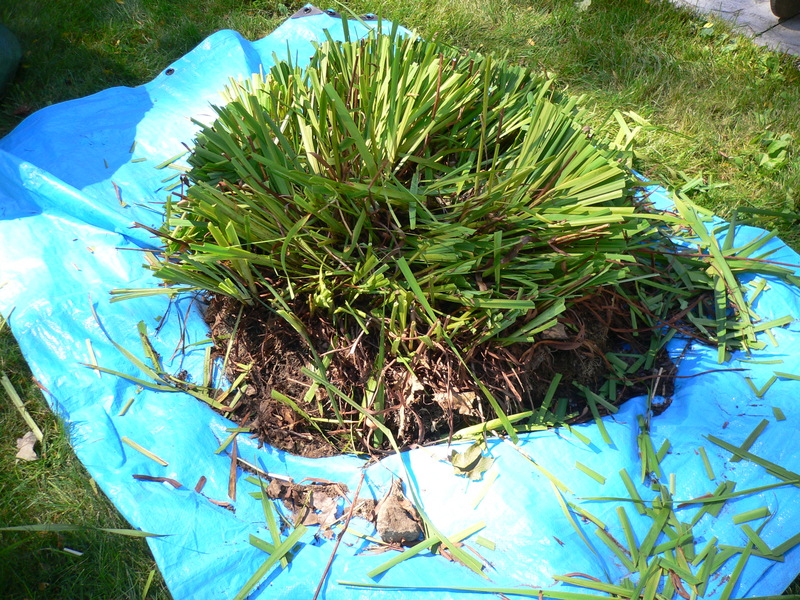 At the end of the day on Labor Day (see September 3, 2012), we were left with a tarp-full of divided but unplanted Siberian irises and two large clumps of irises waiting to be separated. We were hoping to wake up one morning and find that the remaining work had been done but two weeks later, nothing has changed. I guess the garden elves have headed north to get an early start on the Christmas season. We decided that if we didn’t get to it today, it would not get done before winter. We started by scouting a location for the already-divided plants (they have been out of the ground for two weeks and we wanted to be sure to replant them before we ran out of energy). We do not have many full-sun locations on our property and there are not that many partially sunny spots either. 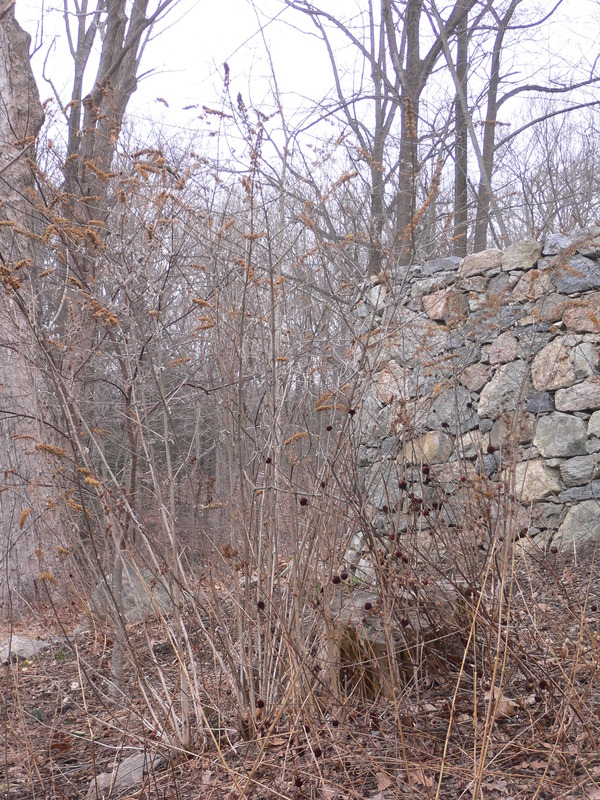 After a tour of the possible locations, we selected the narrow strip of ground between the road and a stone wall that marks the edge of our property. Nearest to the house, the area is paved with gravel; we use it as a pull-out for parking cars. 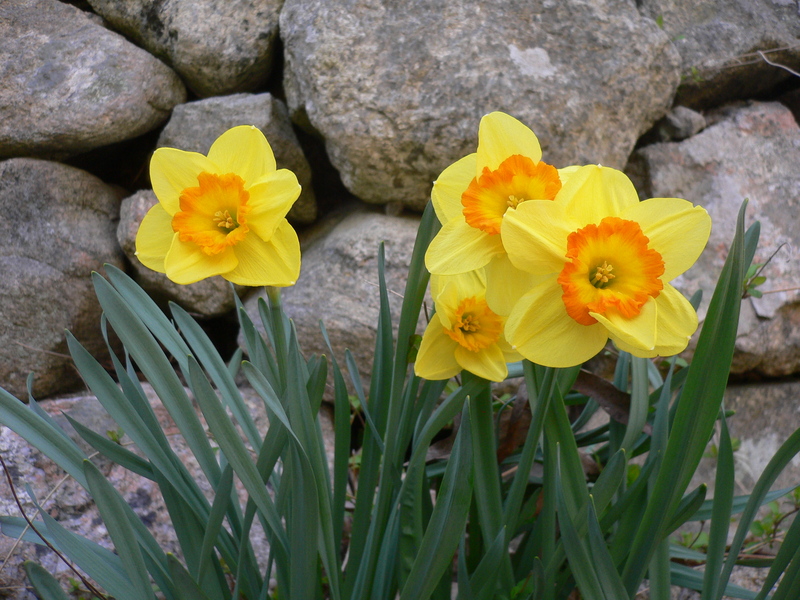 Beyond that, the border is mostly weed-covered with two or three clusters of daffodils providing a small (and brief) burst of color in spring. It is also, of course, very rocky. In fact, it is literally between a rock (wall) and a hard place (the road). As I started to dig, my shovel was met with the usual clang of resistance. The rocks were densely packed but luckily, they were not wedged in too tightly. 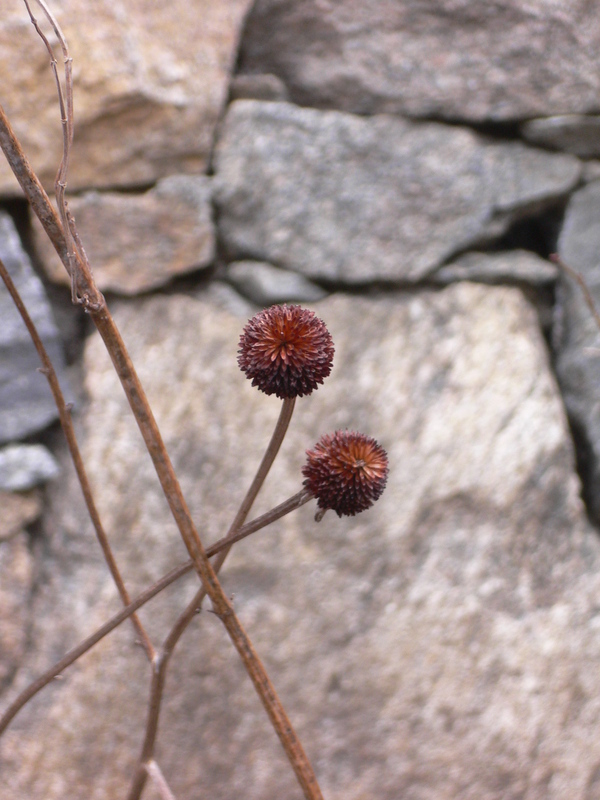 As I removed each one, I tossed it onto the top of the stone wall. Two hundred years ago, this is how the wall was originally constructed. After a half hour of digging, we had cleared an area about 10 feet in length and 18 inches wide. 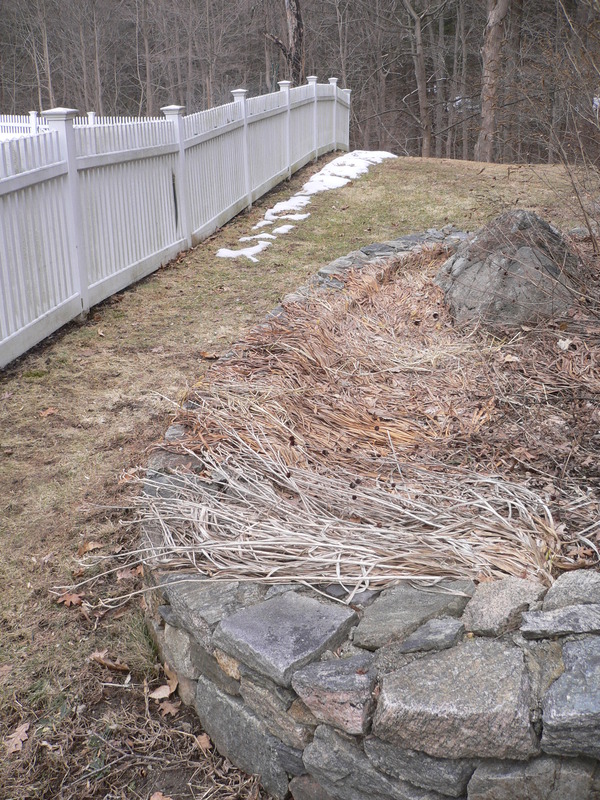 Despite its rockiness and less-than-ideal location, the soil here is dark and rich. 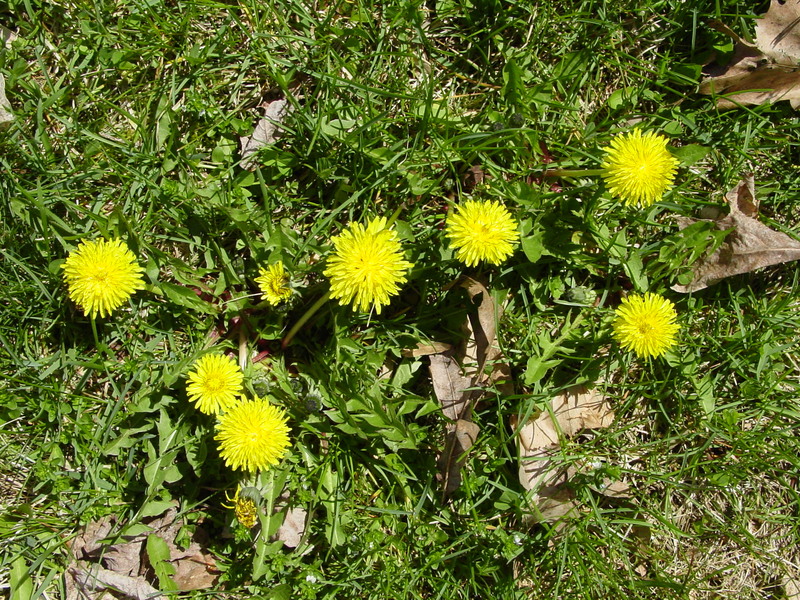 Apparently, many years of weed growth have not depleted the soil of its organic matter. 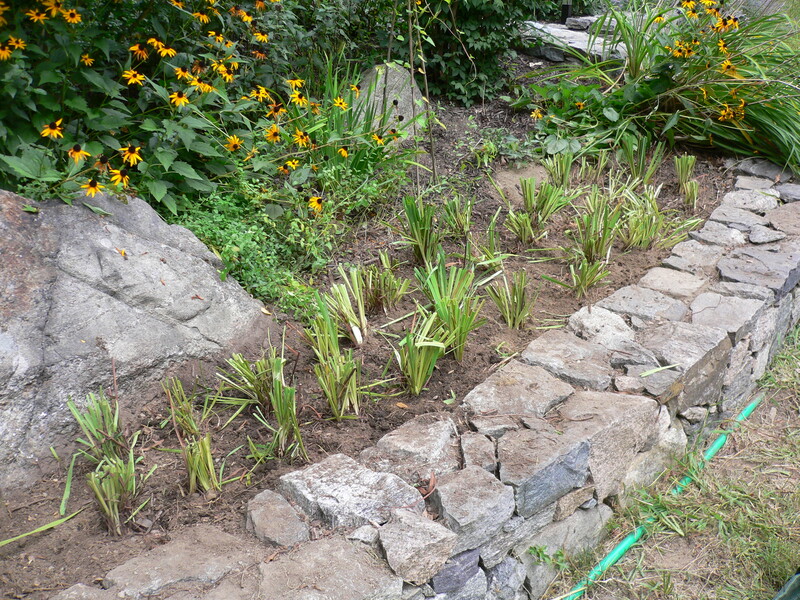 Rachel quickly set the divided irises into the excavation and we covered them with loose soil. As a final step, I sprinkled the ground with a general-purpose fertilizer (to be on the safe side) and watered it in with two cans-full from the hose (which did not quite reach this remote spot). 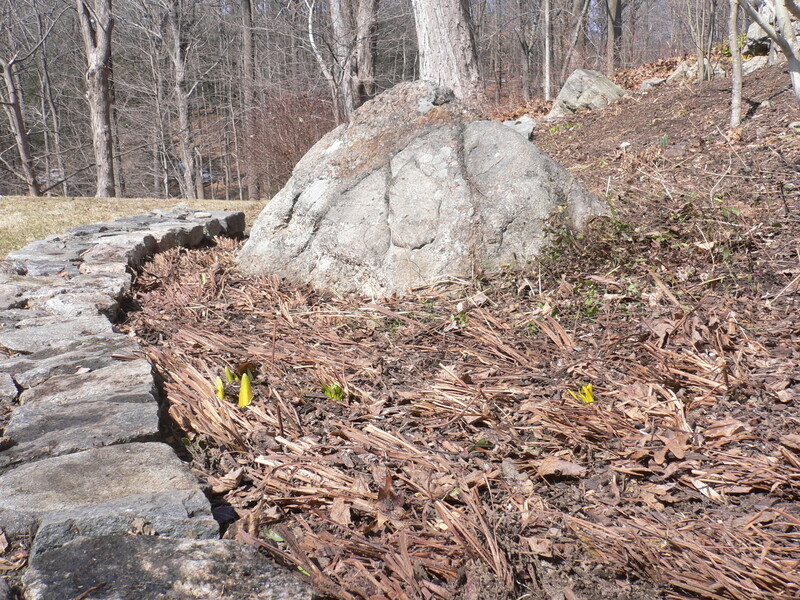 Next, we moved back to the ornamental garden and the two clumps of irises that remained to be divided. After our Labor Day experience we knew what had to be done and started right in (we feared that if we stopped to rest, we might lose momentum). I won’t repeat the details here but we did learn a few important lessons. 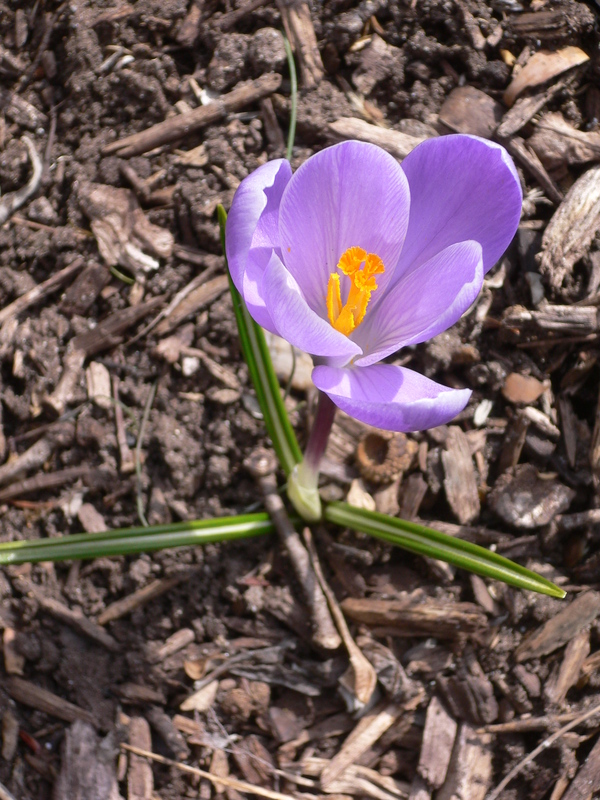 First, digging in the garden—even shallow digging—is best done shortly after a rainfall. When we worked on Labor Day, it had not rained for a week. The ground was hard and dry and that made the digging difficult and dusty. 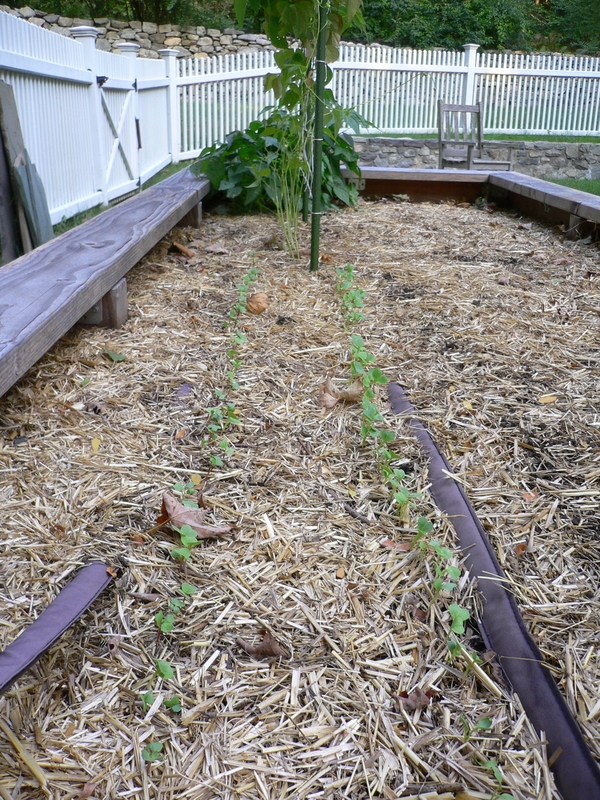 Today, after a light rain yesterday, the soil was softer and more cohesive. 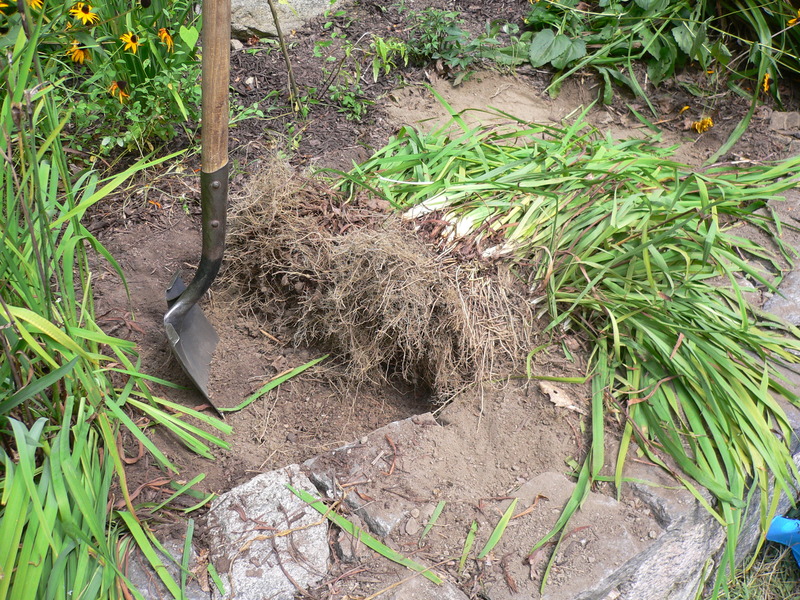 Digging still required a lot of effort but it took significantly less hacking with the shovel to get the irises free. 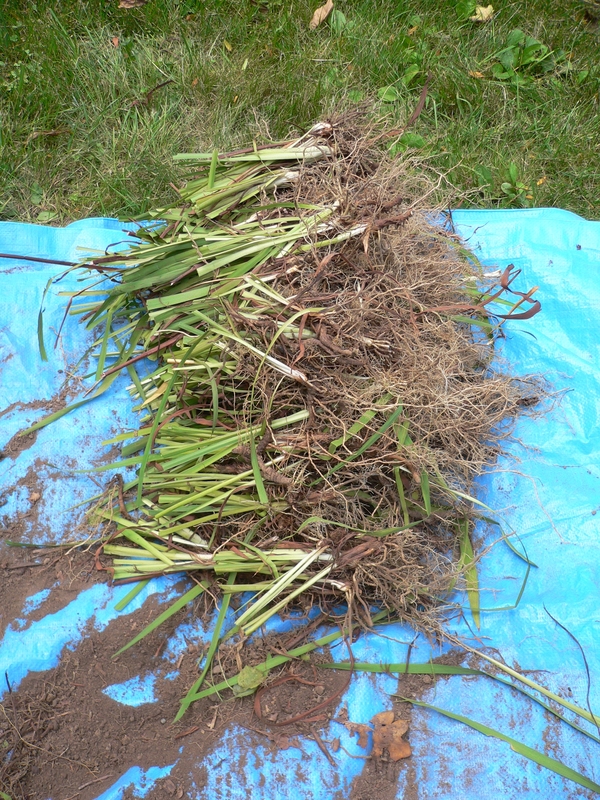 Second, once the clump of irises has been pulled up, trimming their leaves all at once makes separating the roots a lot easier. 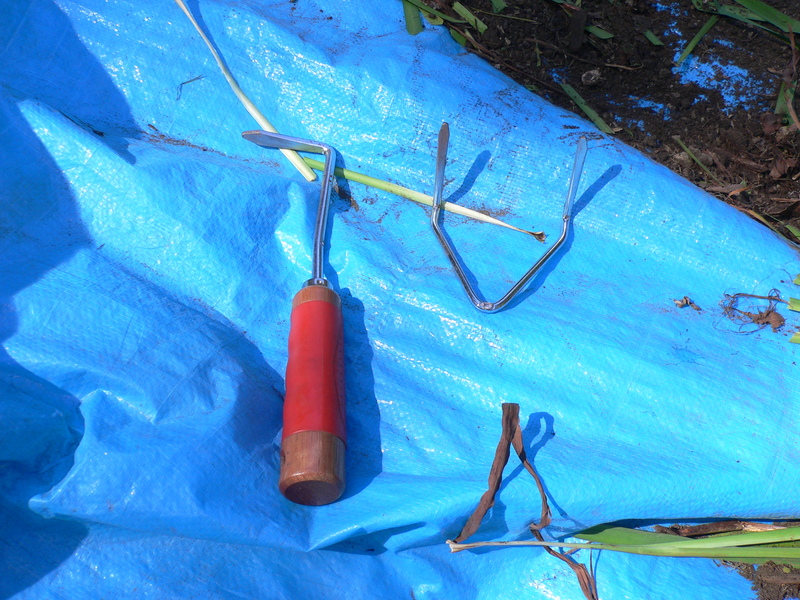 On Labor Day, Rachel clipped each divided rhizome individually, a time-consuming last step. This time around, we used a hedge trimmer to trim all of the irises at once. Essentially, we gave each clump, still intact, a haircut. Third, and most significantly, this has to done much more often. One of the two clumps we divided today was so tightly compacted and so jammed full of rocks and soil that it was next to impossible to split into pieces. I managed to break the small gardening fork while trying to pry the roots apart and I can understand why some people would be tempted to use a hatchet or axe for the job. I have heard that some gardeners do this yearly—my hat is off to them—but every two or three years seems like a reasonable interval. Of course, that last lesson will be the hardest to follow up on. In two or three years, the irises may not be as compacted as they were today but I will be that much older and less enthusiastic about taking on this onerous chore. To commemorate Labor Day, we often take on a project that is, well, laborious. It is not always planned in advance—we do most of our intensive outdoor work on weekends anyway—although we rarely celebrate Labor Day in the traditional way by relaxing and doing nothing. 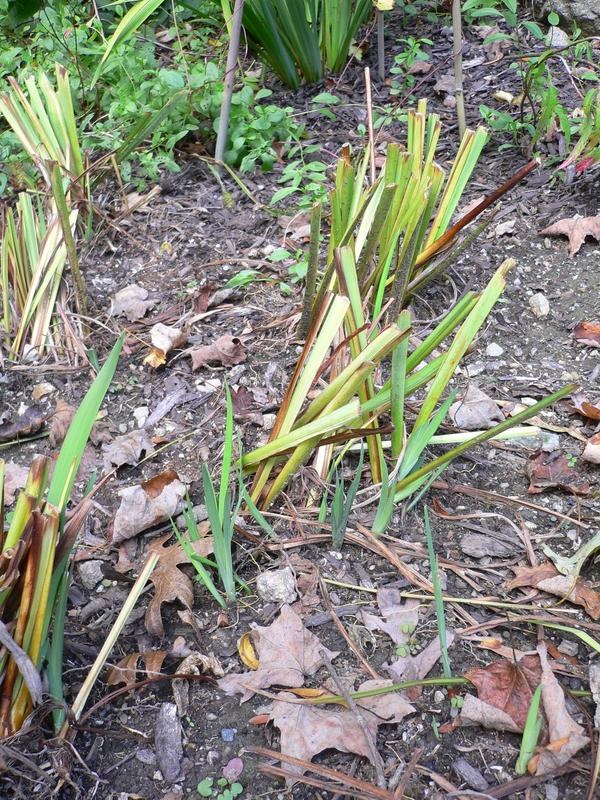 This year’s back-breaking task: dividing the Siberian irises. Why would we want to do this? Good question. 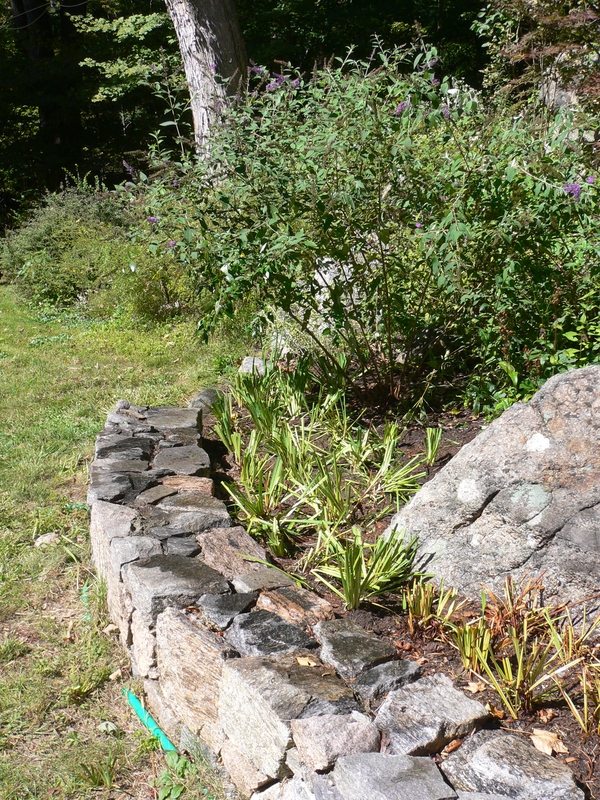 The irises were a gift from a local stonemason, Mario, who did a lot of work for us about seven years ago. Part of his work included the formation of our ornamental gardens and when he was done, we had a lot of space to fill. 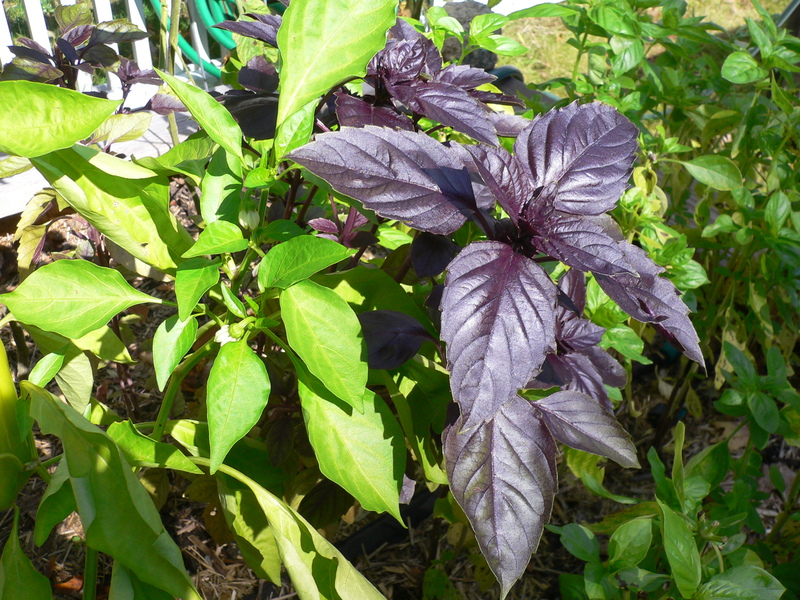 In addition to being a talented stone worker, Mario has a dark green thumb. To help get our new gardens started, he brought us many cuttings from his own garden (which is like what you would see at an Italian villa), including the irises, a Japanese maple and sedum (to plant in the crevices of the stone walls he built). 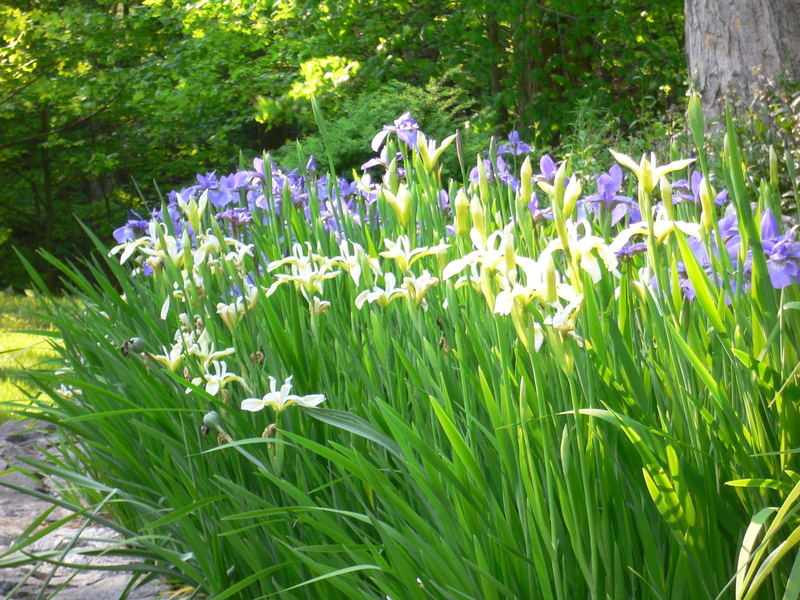 It took a few years for the irises to establish themselves but for the last three years, they have been producing a dense display of purple and white flowers each spring. The irises are very effective at naturalizing themselves and after seven years have densely filled the areas where we planted them. 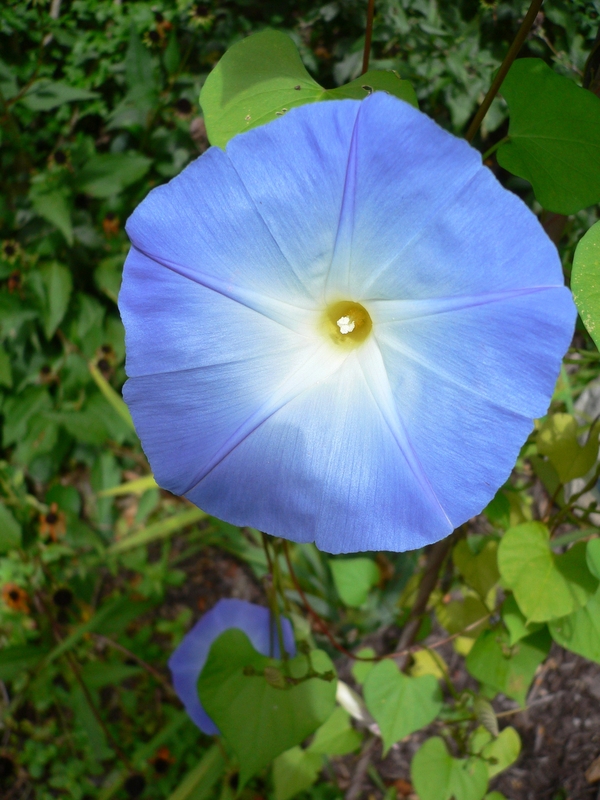 However, as their root systems become more and more compacted, they will flower less abundantly. Typically, Siberian irises form rings of active plants with dead roots at the centers. 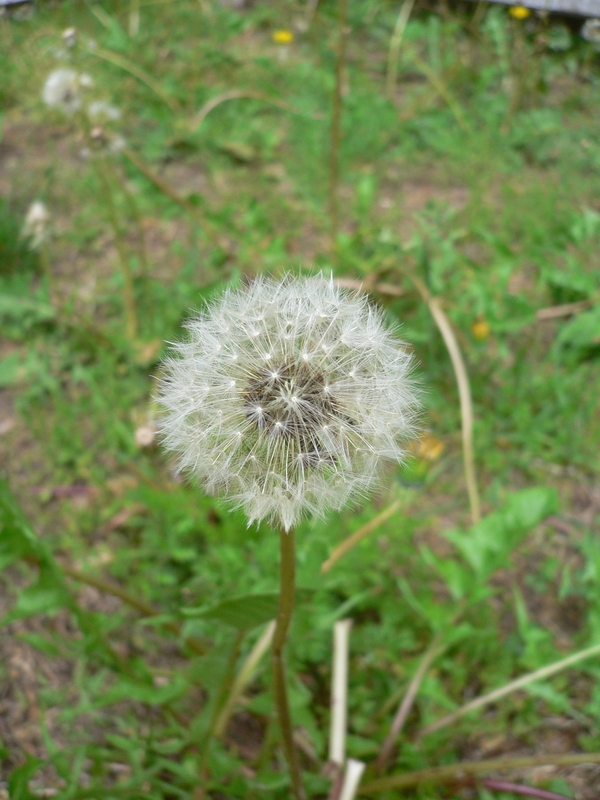 Ours were beginning to display this characteristic. But digging them up, dividing their rhizomes and replanting them ensures that the irises continue to flower profusely.Separating the plants also means that we can spread them out over a larger area (expanding the border that follows the south edge of our main garden, for instance) and transplant them to new locations (along the road, perhaps). Further, we’ll have enough split rhizomes to share them with our friends in town to whom we promised the plants last year. We let that season pass before we could get to them so we are overdue. 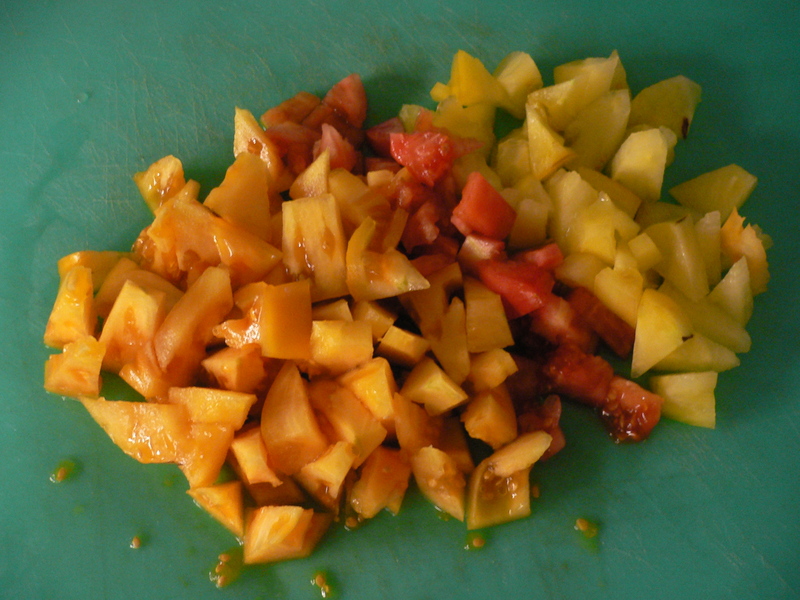 The task is decidedly labor-intensive and required several steps. First, we dug up the irises. 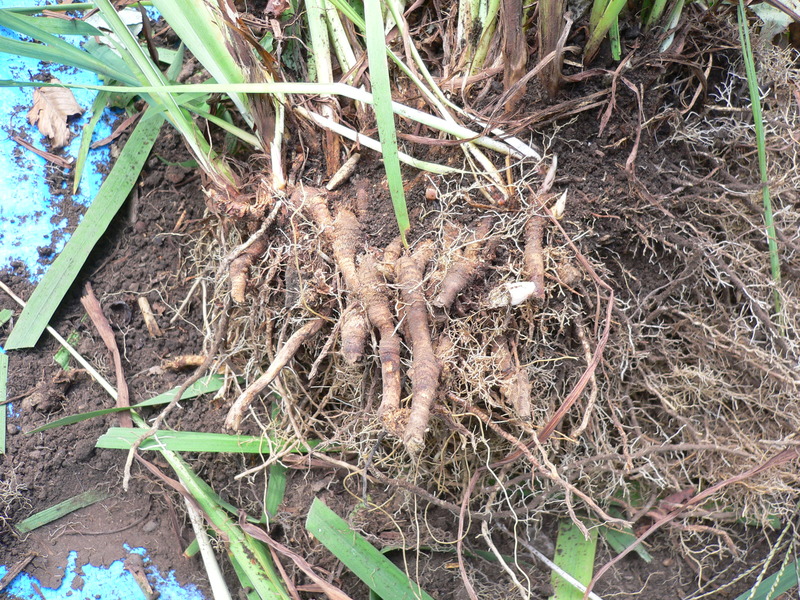 Their rhizomes and roots are densely intertwined and form clumps about two feet in diameter. Removing them is almost as difficult as removing sod but their stems and leaves allowed Rachel to pull up on the irises while I broke the roots free with a shovel. It took about half an hour of picking and tugging to break each mass free and lug it out of the garden bed. 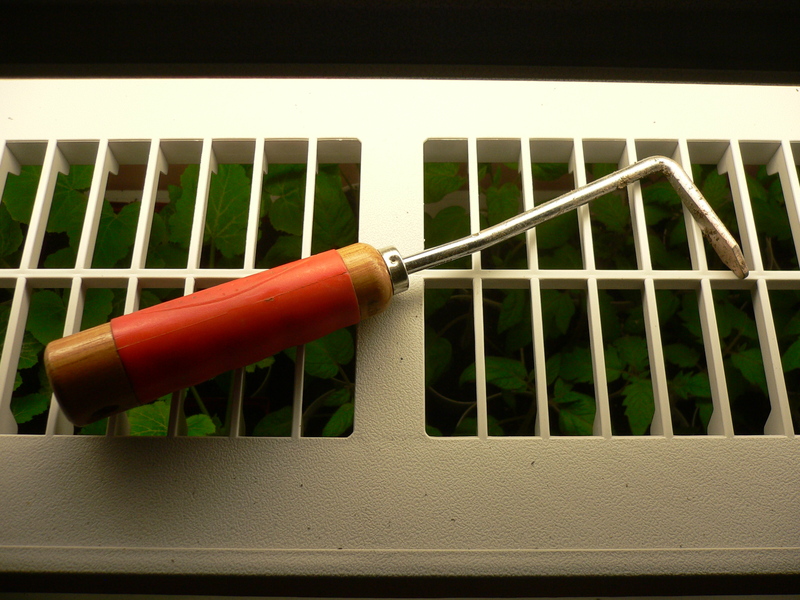 Next, I broke up the root masses using a small gardening fork and my bare hands. (Actually, I wore work gloves.) If we had not let the irises go so long—two to three years is the recommended interval—this part might have required less effort. 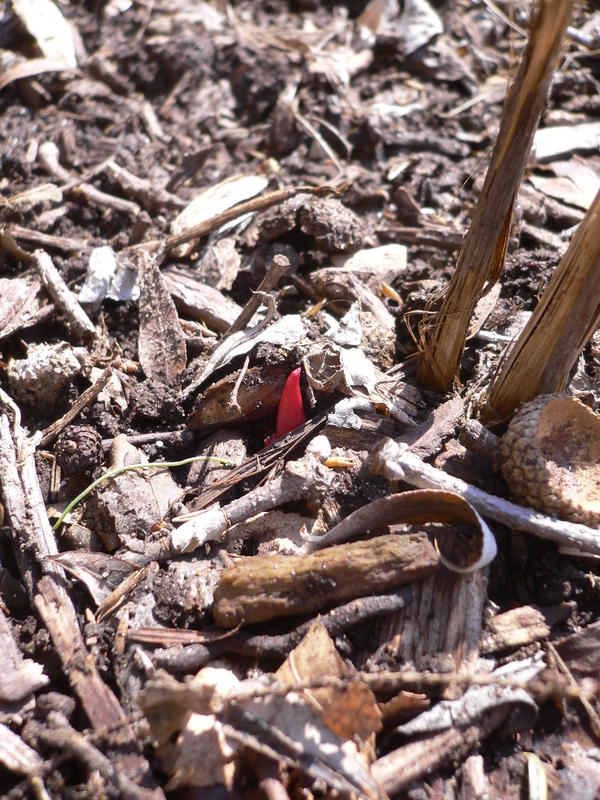 But after seven years, the root masses were practically solid. I used the fork to knock out the trapped soil and rocks and create handholds. Then, I just grabbed on and pulled. 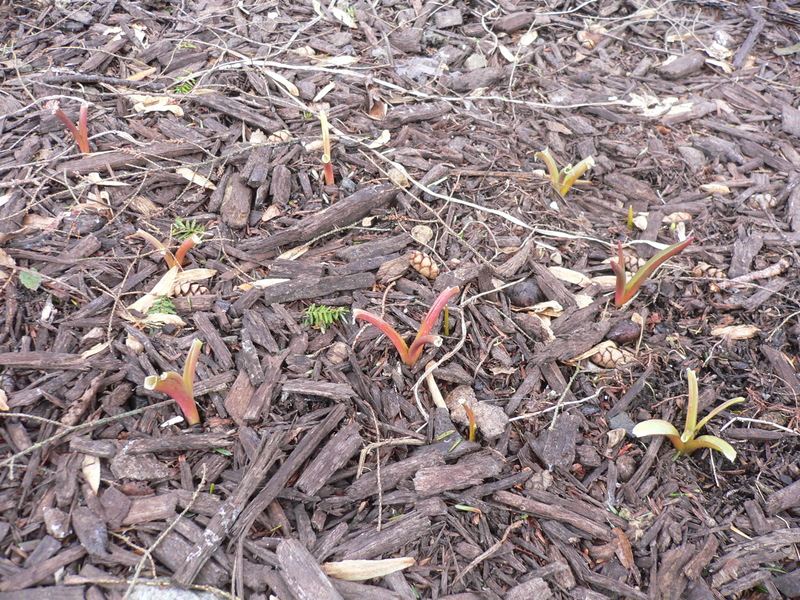 Slowly and with not a little frustration, I broke small groups of rhizomes free and passed them over to Rachel. 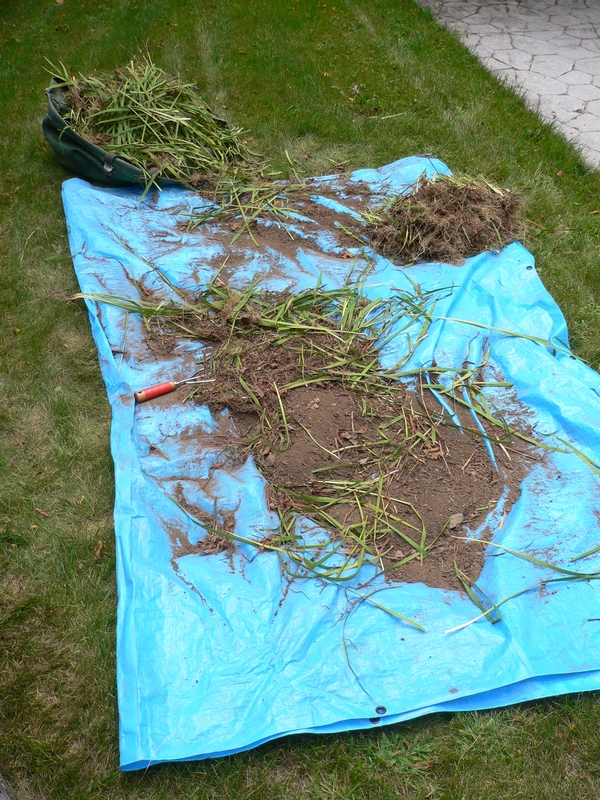 Using shears, she cut off the excess roots and dead portions of the rhizomes, clipped the leaves to a length of about six inches, and stacked the now divided plants neatly on a tarp. 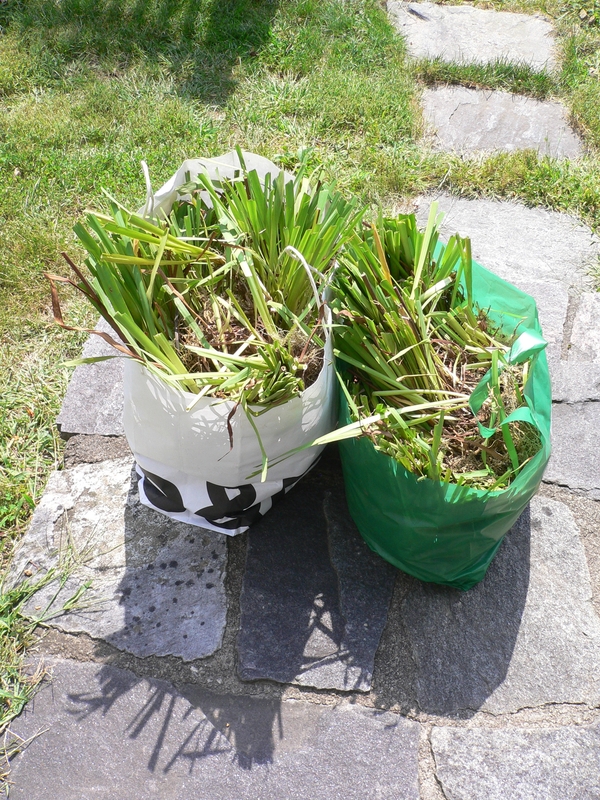 We filled two shopping bags full of irises and delivered them to our friends in the village. The final step was replanting. We returned about half of the irises to their starting place and reburying them in the loosened soil was the easiest task of the day. We spaced them six to eight inches apart and consequently, the area is much less densely-planted than it was when we started. Given past experience, though, it should fill back in over the next few years. 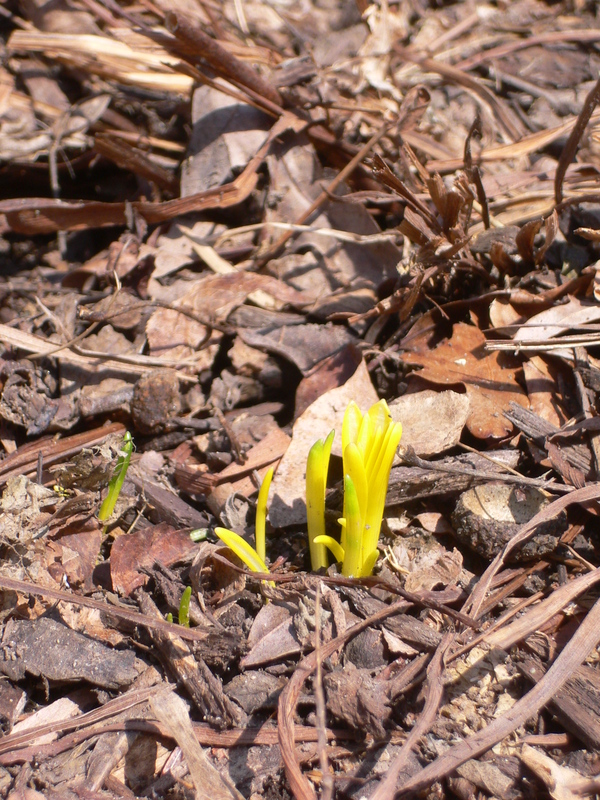 The remaining half—and the two clumps of irises that we have not yet divided—will have to go somewhere else. But that is for another labor day (one with a lower case L).